Utilize SharePoint’s extensive capabilities to share and store project documents that directly embed into HP PPM. Provide internal & external resources with access to project information and artifacts in SharePoint. Instantly create project workstation in SharePoint the moment a new project is opened in HP PPM. Looking to increase accessibility to HP PPM projects? Project Workspaces is an innovative solution that enables users to instantly create a collaborative project workstation in SharePoint when a project is built in HP PPM. These new dashboards in SharePoint provide team members a comprehensive work space providing them access to project information, status details, team member posts, blogs, and project documents. Project Workspaces breaks down access barriers to connect all your project team members. 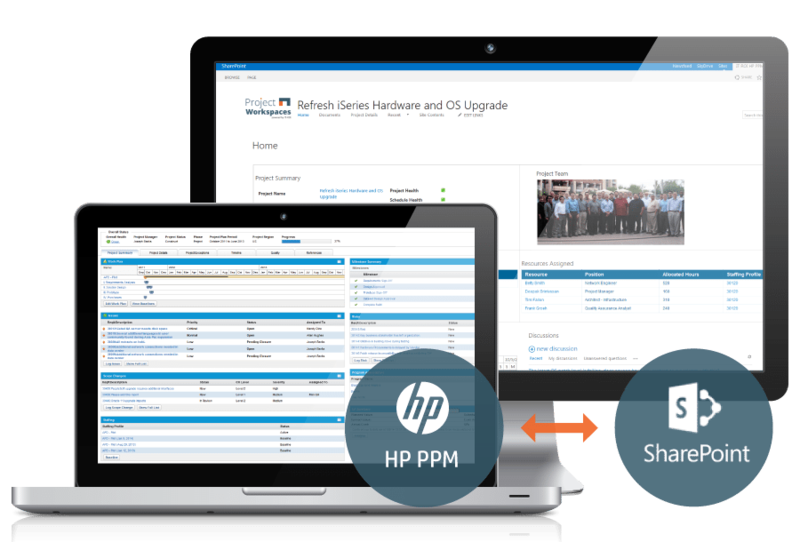 Conquer the digital divide between SharePoint and HP PPM with this dynamic HP PPM SharePoint collaboration. Access project information, status details, team member posts, blogs, and project documents. Easily create new workstations with Project templates for SharePoint. Link reporting in SharePoint directly back to entities in HP PPM. Manage accessibility with role based access. Enterprise wide HP PPM and SharePoint integration within a matter of days. The Ultimate HP PPM and SharePoint Collaboration.